Skinless chicken breasts typically conjure up an image of a pale, flavorless, tough piece of protein. Definitely not appetizing. However, many recipes call for cooked chicken breast of some sort (chicken alfredo, chicken pot pie, etc.). But, how do we cook chicken breast in a flavorful fashion that allows it to stand on its own as an entree as well as being capable of reuse in later recipes? 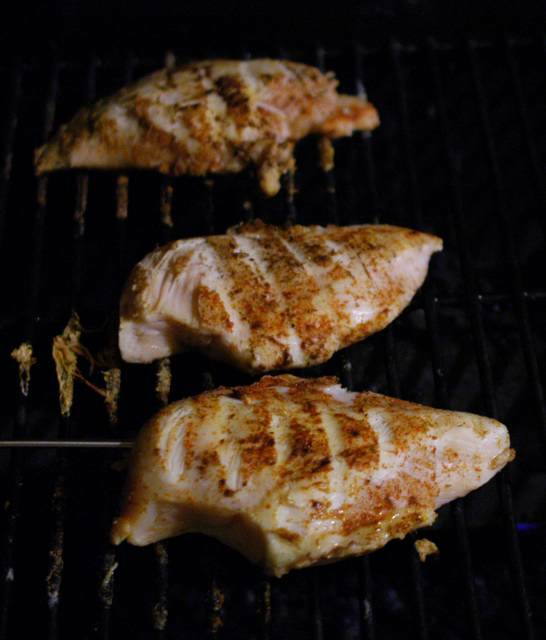 Here's a simple recipe for grilling skinless chicken breasts that yields tender and flavorful breast meat. This is the secret: brine the chicken breasts. Take four cups of cold water and add a tablespoon of table salt (add more if using kosher salt - about 1-1/2 to 2 tablespoons). Stir the water to get the salt to dissolve. Once the solution is no longer cloudy and is clear, put the chicken breasts into a large resealable plastic bag and pour the solution into the bag. Seal the bag and refrigerate for at least three hours and no more than six hours (the chicken may become too salty). Rinse the chicken after you remove it from the brine and dry with paper towels. Now rub 1/2 tsp. ground cayenne pepper, 1 tsp. ground coriander seed, 1/2 tsp. ground cinnamon onto both sides of each breast. Place the breasts onto a heated grill for 3 min. on each side. Adjust the grill to low (or move the breasts to the low side of a two level fire) and cook until the internal temperature reaches 160°F (70°C), about ten minutes (on my grill). If you don't have an instant read or meat thermometer, I recommend two alternatives. First, you can poke a hole in the breast (with a knife or fork) and see if the "juices run clear". If the chicken is undercooked, the liquid that comes out will carry a pink or yellow hue. When the chicken is done, the liquid that comes out is clear as water. Alternatively, you can cut into the chicken and look at the color. The breast should be completely white. Another popular method is to press on the chicken and feel if it is done. This is a technique that takes experience and is not recommended for your first time. The chicken will feel springy, but not soft. It should also not be hard (then it's overcooked). The benefit of this technique is that the chicken is not violated with holes or cuts that can release juices that would otherwise keep the breast tender and juicy. I recommend learning the touch technique by pressing on breasts that are done so you can get a feel for how the breast should feel for future meals. 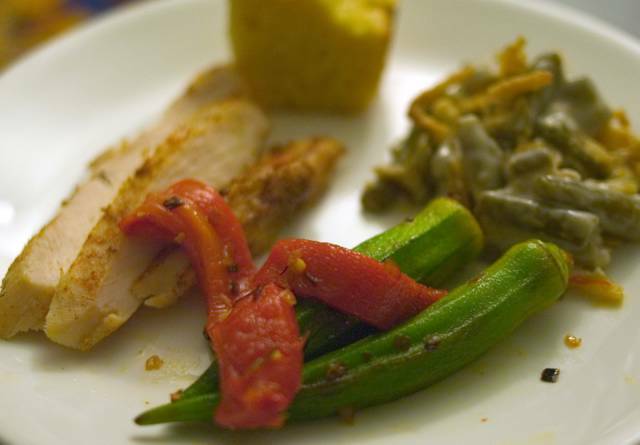 I served the chicken breast with the Sauteed Okra with Roasted Red Peppers, Green Bean Casserole, and fresh corn bread. The cinnamon is a good idea. I'll have to give this one a shot. 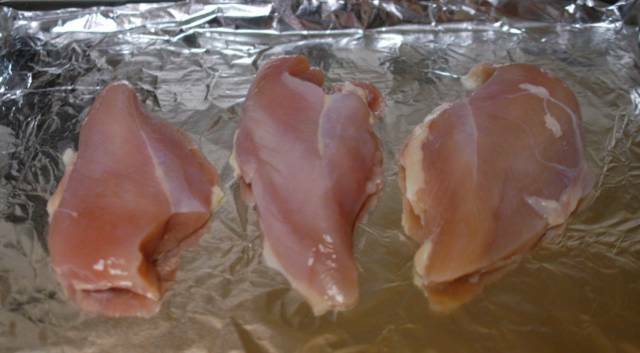 What is 'brine' and how do you 'brine' chicken breasts? I'm sorry. I had meant to go back and write that section before publishing the article. Because of my schedule, I write my articles a little at a time (whenever I can grab a few minutes) and don't necessarily write them in any particular order. Usually, I will write a framework or outline of an article and then fill it in as time permits. In this case, I forgot to fill in the details to the brining. No problem, Michael! Thanks for the update. I'm actually a semi-decent cook (enough that my wife prefers my cooking even though she's better at it) but I haven't 'brined' anything before. Looks like I'll have to experiment soon. Love the site! Even more, I love baiting the anonymous idiot that leaves trolling comments... but then again, I'm evil (well, not really, usually). It would be simple and taste about the same just to use Old Bay seasoning in place of your spice concoction. Good recipe, served it with a squeeze of lime. Posted: Wed May 10, 2006 11:02 pm Post subject: Brine with sugar??? I have checked around the internet and a lot of recipes call for an equal amount of sugar added to the brine. Apparently the chicken grills to a nice color when the cooked because the sugar carmelizes. Why no sugar in your brine recipe? Even money Jan-or-Anson is from Maryland! Before I relocated here, someone in Michigan warned me: 'You better get used to the taste of Old Bay seasoning, they put it on everything'. Truer words have rarely been spoken. I regularly cook skinless chicken breasts on the grill--it's a very Atkins kind of snack, it is quick and easy to make and I can keep then in the refrigerator for whenever I want them if they aren't all eaten for dinner. I never brine it or do anything special. I throw on whatever genre of spices I am in the mood for, and set it on a hot grill. It always comes out juicy and flavorful. The most important thing to do is NOT overcook it! Skinless chicken breasts cook fast. Placing it on a hot grill will give you light char marks from the grids. Don't cook it to have a uniform seared surface like a steak or even like a skin-on or bones-in breast. Plump breasts, not chewy, kids both love it. Mother in law asked for the recipe. Don't think you could ask for higher praise!!!! Oh mi gosh, that reads so wrong. I mean't the chicken breasts. Please excuse me!!!!!!!!! What is the purpose of the brining--what does it do? Also, do you have any suggestions for someone who doesn't have a grill?